With the UC Browser becoming one of the most popular third party browser for smartphones, the company has now released a new version with new features. UCWeb has announced the release of the updated version of the UC Browser for Android with version number 10.7. The new version adds in a lot of new features including a refreshed UI and improved navigation. Users can add their favourite widgets on the top thereby making it faster and easier to access and discover new content from the app. The new update is said to make use of the browser’s cloud technology to increase the speed of webpage loading. The updated UC Browser for Android comes with specially designed background images. Further users can also customize the home page easily with a new navigation page which features a card-style arrangement of different tabs. Users can then rearrange their cards, such as Headlines, Top Sites, Jokes, Cricket Match, Cricket Topic, Top Free Apps, Opinion, Trending Video, Shopping based on their preferences. 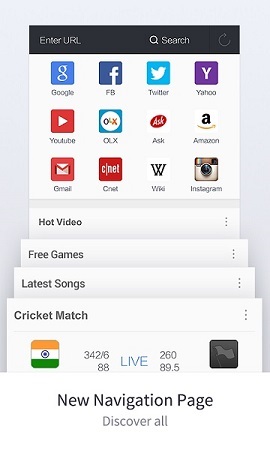 You can download the updated version of the UC Browser for Android from the Google Play store.